I’m sorry - I just came across TaskPaper and this looks so good! But: I’m missing one thing - I’d like to see the timestamp when I finished a task - like @done 2016-03-21 10:11. Can I achieve that somehow? Haven’t found no solution on the forums or the options page. When you select that, the tag becomes @done(2016-03-28). value = null; // If any item has the attribute, then remove it from all. I already told I’m new, so I hope you don’t mind my next question (isnt explained in the FAQ or the manual): what Do I do with this code above? Don’t see any inapp code/script editor or so. 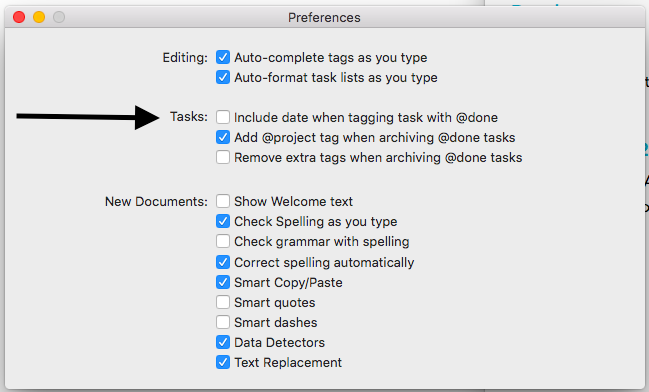 I used Keyboard Maestro, which (among many other things) lets you link the script to a hotkey (like the default ⌘D for done tasks). what Do I do with this code above? Thanks a lot. That’s great support here! I have noticed that the date stopped being added to my @done tasks. I have the box checked in the preference pane. I have tried checking and and unchecking the box to see if it kickstarts it, but no go. Do I need to have a script or something installed to make it happen? I’ve just been testing and this all seems to be working on TaskPaper 3.7.3. Please let me know if any of the above solve or not. the CMD - D worked!